Terri is a 19" hard molded plastic, drink and wet, sleepy eyed baby doll that was mine as a child. My cousin and I both have "Terri" or "Terry" dolls. I copied my doll's name from Jane. (Jane is ten months older than me, and must have known many more names than I did at the time). I'm not sure how we were supposed to spell it. When we got the Terri/Terry dolls, I doubt that I could even write or spell. I'm guessing it was in late 1950's. 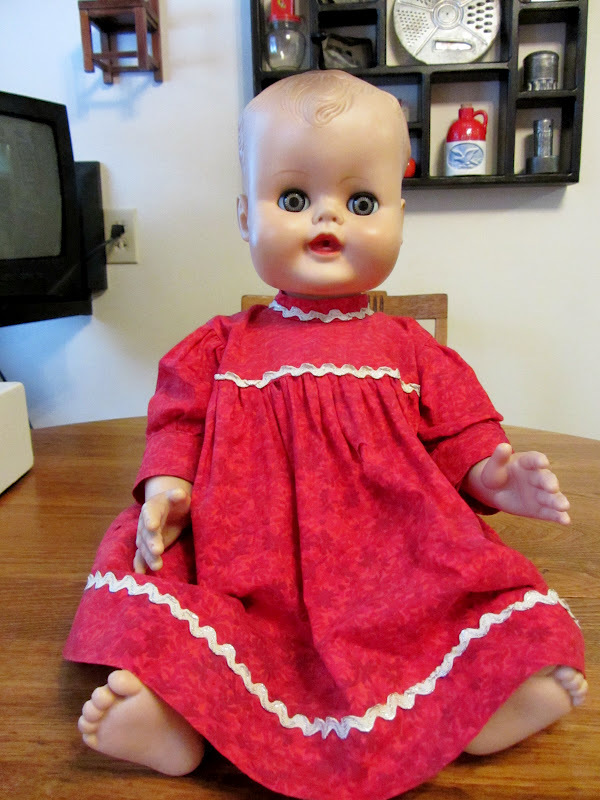 Our Grandma sewed clothes for our dolls, including the red dress with the ric-rac that Terri is wearing. 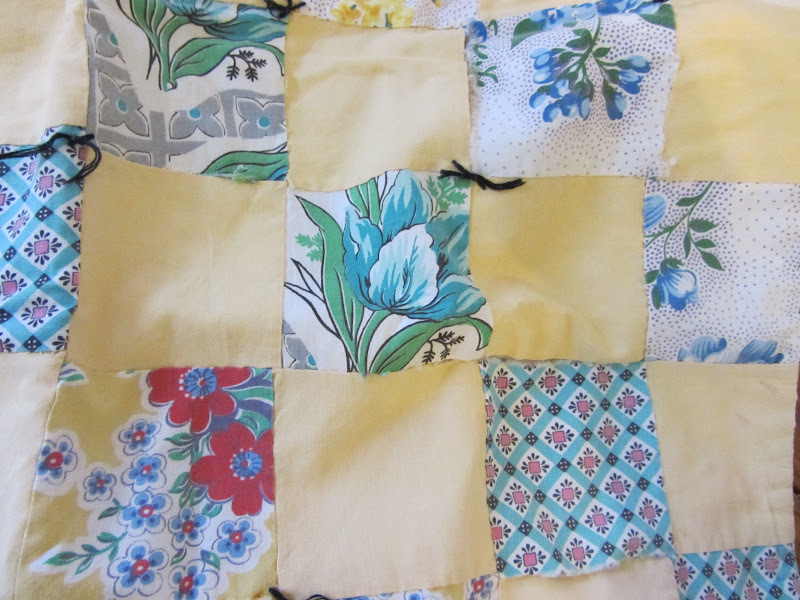 Terri even had her own patchwork quilt courtesy of Grandma. This is Terri up close and personal. 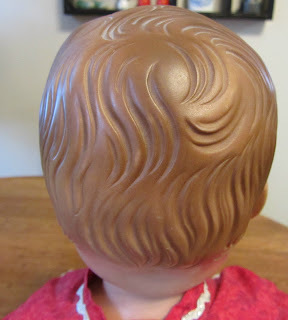 I looked on ebay this morning to see if this doll was listed, and I saw at least two dolls that had this marking, one was priced at $99 and one at $49. But, it doesn't really matter what she is worth, she is not for sale. Just curious about details on the doll, mostly the manufacturer. My kids think she is kind of scary looking. But not me! I think she is cute! 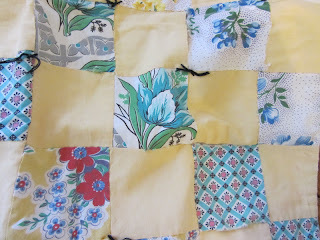 You took great care of Terri, her quilt and dress! I can tell you have very fond memories. Visiting from the Cozy Home Party. I only clicked on this because my name is Terry and the close up of her head really looked freaky to me. 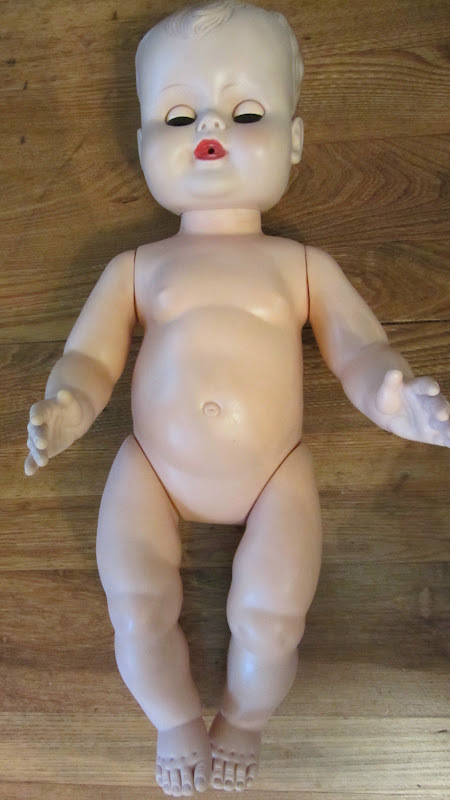 Now that I see and read your post, it reminds me of a doll I had in the 60's called Baby First Step. I loved her. But the best baby dolls are like your Terry without real hair. That way they always look good. Great memories. I have my old dolls as well. Mine are from the 50's. Fun to see what they are selling for. A couple years ago, I got rid of a few that looked bad.....what was I thinking. I still have Brbie and Ken.....the first ones. I came over from Cozy Home Scences. Was that your kitchen as well. Very cute. Signing on to follow you. Ihave a cousin named Charlene. Spelled differently. I was one of those little girls that always had a doll with her, so I enjoyed seeing your "baby". You really took care of your doll and it's clothes, which I'm sure you are grateful for now. 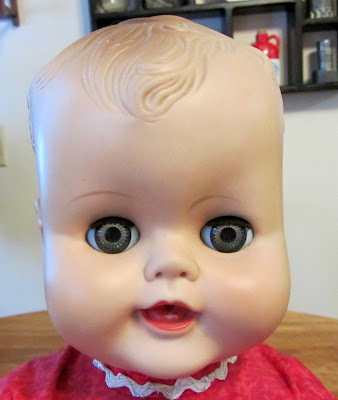 My favorite childhood doll has turned a strange yellow-ish hue. I just tell people she has jaundice whenever they look at my doll collection. My guess is it turned color from all the times I took it outside to play with me. Thanks for sharing your wonderful memories on the Your Cozy Home Party this week! 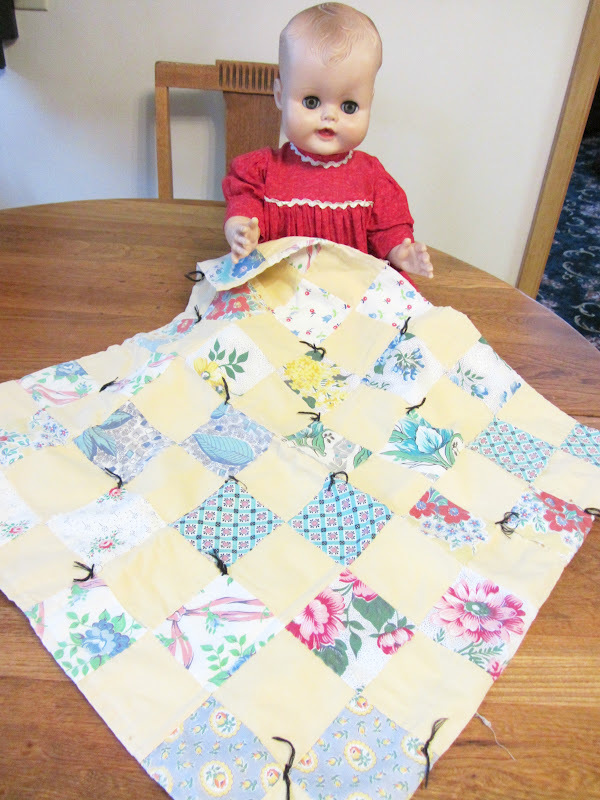 I really like your Terry doll... and I especially love the red dress and quilt your grandmother made. It's wonderful that you've kept her all these years...she's in good hands! I have the same doll....only...for me, she was a he! I still have him too! !